Interview with Clément Chéroux by Daniel Escorza in Mexico City on November 30, 2009. Daniel Escorza. 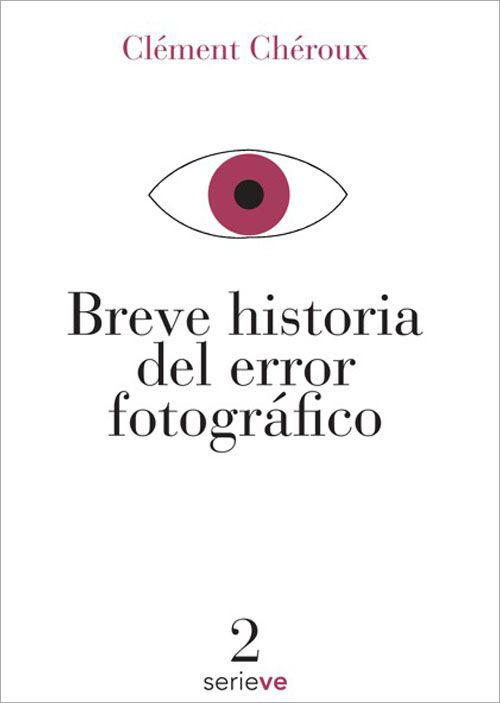 (DER).- The translation into Spanish of the Brief History of Photographic Mistakes has been a novelty in Mexico. After reading his book, which deals extensively with what an unsuccessful or failed photograph reveals, it is essential to talk about the importance of imperfections or mistakes in the photographic event. Could one extend this idea that photographic errors are an instrument of evaluation for photohistorians? To what extent is error a methodological instrument for photohistory? Clément Chéroux (CCH). First of all, I would like to say that the concept of "mistakes in photography" must be taken at two levels: on the one hand, there is the use of error by photographers and artists and on the other, the use of error by photohistorians. In this book, I navigate between these two levels of error. Thus, for example, I speak of the way artists such as László Moholy-Nagy used error to under the mechanisms of photography better. I also show how some artists used error to experiment with poetry or to search for a poetic or artistic result, such as Man Ray. These two photographers are at this same level, which is the use of error by photographers and artists. The third part of the book is concerned with the second level, in other words, how mistakes made by photographers (or at the time of their interpretation) can show us something about the unconscious in photography. In the third part, I analyze for example, the late 19th century photographers who attempted to photograph dreams, thoughts and the soul. I show how most of their results are in fact errors made during the technical production of images and as a result of these errors, they project what they want to see: they see dreams, thoughts, souls and even ghosts. So, in their projection of the unconscious, we can understand something of the mechanisms that come into play when someone looks at or interprets a photo. It is a perfect example of study, almost a prototype, that enables us to understand how the mechanisms for interpreting images operate. I use the case of the spiritualists I mention in the third chapter as a prototypical case, a textbook case, to explain how the viewer of a photographer projects himself onto the representation of a photograph. DER. In this respect, when you talk about the shadows in a photograph, you have said that before the avant-garde movements, the appearance of the photographer's shadow in his own photographs, as in the case of Lewis Hine or Augustín Casasola or Abraham Lupercio was due more to the operator's neglect than to a conscious act. Does this mean that the appearance of shadows in photos has been re-evaluated since avant-garde movements? Specifically since Man Ray? CCH.- Photographic teaching manuals for 19th century photographers include a series of technical considerations or advice to prevent the photographer’s shadow from appearing in the visual field of the photograph. Throughout the 19th century, a concept of photography as a direct, exact reproduction of reality, in other words, faithful to reality, was defended. The appearance of the photographer's shadow in 19th century was rejected precisely because it reminded us that it was not exactly a copy or a direct, faithful imitation of reality. Instead, it showed that there was a human being behind the photograph, in other words, it was a photograph taken by a man. The fact that a human being was involved means that there was both a capacity for error and an apparatus that produced this photo. In order to respond to this will to have a representation or faithful copy of reality, the photographer was advised, as much as possible to avoid the appearance of this shadow that broke away from this concept. So after writing this book, I came across an ethnographic photograph published in a journal, probably for an article on an ethnographic subject or something of that ilk. The original photograph proved to have a shadow but at the time there were no offset or mechanical reproduction methods for the photo (I can't remember whether they have to do a sort of engraving of the photo). Anyway, the person who did the engraving eliminated the shadow in order to print it. In other words, he did not faithfully copy the photo but removed the part of it he regarded as a flaw. In the 19th century, shadows in images had to be concealed. Let me put that another way: following the emergence of avant-garde movements in about the 1920s, the same reasons that led to photos being redone or to shadows in photos being eliminated began to interest these movements. In other words, the fact that the photo was not a faithful copy of reality but rather something that had an operator and an apparatus was made conscious. Man Ray and Moholy-Nagy for example, wanted to do away with the idea that photos are an objective reflection of reality. They wished to say that it was a mechanism with an operator and an apparatus, which is why they consciously and purposely re-introduced shadows into their images. This is one of many examples that explains and shows how a 19th century mistake turned into an aesthetic proposal in the 20th century. DER.- A propos of this, I am struck by the semantic distinction you make between “invention” and “discovery,” in other words, by the work of Man Ray and Moholy-Nagy respectively. “Invention” meaning something you look for carefully and “discovery” meaning a mistake or chance event that allows you to see something. What would be the condition of those who currently make inventions or discoveries? Where are they currently located? Who for example makes a pinhole camera, which is a mistake to begin with, since it has no lens and on the other hand, digital photography, where mistakes are increasingly "dealt with" by technology? Is it possible to talk of this dichotomy? CCH.- Do you think that pinhole photography is on the side of invention and that digital photography is on the side of discovery? If that were the idea, I do not fully agree with the idea of such a sharp distinction. I think that you can invent and discover as much with a pinhole as with a digital camera. DER. You have questioned the notion of photographic mimesis in the sense that a photographic error corresponds to an alteration of the mimetic power of photographs, in other words, the less mimetic a photograph, the more failed. In this respect, what could you say about this sort of paradox? That the less a photograph loses its mimetic capacity, the less it is considered to be a photograph or the further it is from the notion of photography? CCH.- Yes. Precisely what I say in my conclusion is the fact that this could change in 20 years. In other words, this concept is subject to change. In fact, until nowadays, it was thought that the further away a photograph was from mimesis and reality, the more it tended to be regarded as a “failed photograph.” I give an example of this in the book but I am going to repeat it to support this idea. I did an experiment with my students when I showed them a canvas painted totally black and a totally black photograph. Most of the students surprisingly yet systematically stated that the canvas painted black was still a painting while the totally black photography was just a piece of black paper. Thus the photo had lost all recognizable features of a photograph while the black painted canvas continued to be a painting. This mean that perhaps a totally black photograph would be a complete failure. Whether totally black or white, a monochrome photograph would be the essence of a photographic mistake. This shows that photograph continues to be regarded as primarily mimetic, and that when it loses its mimetic nature, the photograph is completely lost, to the last detail, to the point of not being recognized as a photograph. We are experiencing enormous changes; thanks to the emergence of digital photography, there has been a crisis of representation, and it is very possible that in another 20 years, I will come to a completely different conclusion. In other words, perhaps one day, within the definition of what photography is, the parameter of mimesis will no longer be required. I don't understand, why do you think this is a paradox? Why did you frame it as a paradox? DER.- Well, I framed it in the sense that we know that any photograph (regardless or whether it is a mistake) is NOT reality. In other words, to begin with, a photograph is a fiction, which appears to be its basic premise. Perhaps I unconsciously associate the concepts of error and fiction. CCH.- In actual fact and I use this as a basis, for example, for describing what are failed photos, which is what happens in commercial laboratories for amateurs. They have a method for deciding which photographs are "good" and therefore charged for and which are "failed" ones. When a person's face has been cut off, in other words, you cannot see his eyes, the photo is regarded as having failed, because the eyes allow us to recognize a look. Conversely, if his forehead has been cut off, there is no problem and the customer is charged for the photo. If the photo is cut off above and below the face but we still have the eyes and nose, it is regarded as a good photo. When the eyes are cut off and we can only see the person's face from the nose downwards, it is regarded as a failed photo. When I see the eyes, I can recognize the person and we can say that mimesis is operating. It is therefore regarded as a good shot. If I cannot recognize the person, because I do not have the basic features that will enable me to recognize her, such as the eyes, then I am outside mimesis and therefore it is regarded as a failed photograph. DER.-Lastly, reading your book inspires those of us who are devoted to the history of photography in Mexico. What could you say about the authors, work or journals produced in the south of western Europe or outside the United States? Do you know what is being done in the field of the history of photography in Mexico, for example? CCH.- I think that in Mexico, you have one of the best journals I know, which is Luna Córnea, which is absolutely extraordinary. It has done an exceptional job for over 15 years, not only on Mexican photography but on photography in general. I also recently saw the journal Alquimia and the few issues I was able to look through had extremely interesting issues. It is true that the problem of photohistory is that it is too closely modeled on art history. I think that both the United States and Europe suffer from this effort to base photo history on art history. From the little I have seen, I think that the historiography of photography in Mexico could avoid that process. In other words, here they managed or are managing to escape from the straitjacket of being engulfed by art history. I think that the history of photography is more independent from art history here and more original, at least, from what I have seen. DER.- Thank you for your time and for sharing your ideas with us. el error humano, el error de la maquina y el error del contexto. ¿cómo podria contactarme con Clement Cheroux? "La aparición de la sombra del fotógrafo en la imagen en el siglo XIX era rechazada porque precisamente nos venía a recordar que no era exactamente una copia, una inscripción directa y fiel de la realidad, sino que había un ser humano detrás de esta toma, es decir era una toma hecha por un hombre, y cuando se dice humano también hay una capacidad de error, así como también un aparato que hacía esta foto." The main criterion for them is your ability to repay any Wisconsin Loans Online, they are not interested in your previous attempts, the current one is all that matters. But at the same time, it acts only with sexual arousal. Cheap Viagra has a number of advantages in comparison with injections in the sexual organ or other procedures aimed at treatment of impotency.